Hello and a good morning to you! Brrr, it's been cold the last few weeks, right? We could sure use some signs of an early Spring right about now. And according to Punxsutawney Phil, an early Spring is predicted. We hope he is right! In the meantime, we have some fun new designs that will get you in the crafty mood for Spring. Break out your pastels, because we're talking flowers, birdies, chicks, and fairies! We hope our February Release will knock those fuzzy socks off your feet! First sneaky peek is......... Little Fairy Agenda! Little Agenda fans, you know the deal! A stamp full of little fairies awaits! We've also got this super beautiful and cute new set called Birdie Wreath. The largest wreath is big enough to adorn the front of your card panel, then decorate away with a bunch of embellishments of flowers and leaves and those birdies! Hold onto your hats, the chickies are here this month too! 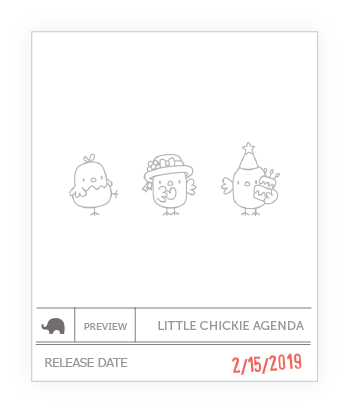 These Little Chickie Agenda are hatching just in time for Spring! And finally, we've got these large sized poppy flowers that are beautiful on their own but, can you imagine the fairies fluttering around these poppies? Thanks for joining us today! Intros start tomorrow with a special guest designer -- which just means your eyes will be in for a treat! See you tomorrow! Adorable as always, especially can't wait to get my hands on those cute little chicks! Eek! So cute!! Can't wait to see everything! Oh those fairies and chickens!!! Eek!! I've got to get these fairies!!! SO cute!! 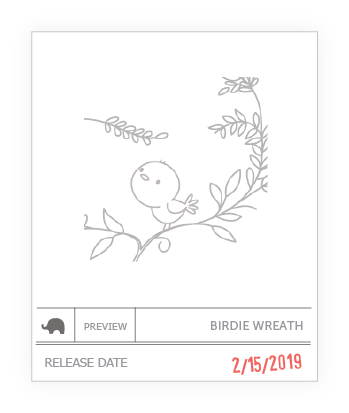 I'm so excited for more Little Agendas, and the Birdie Wreath looks like it's going to be beautiful! Yay! More adorable Little Agendas! I love them already! And I can't wait to see the full Birdie Wreath set! Love the birds!!! Can't wait!! !